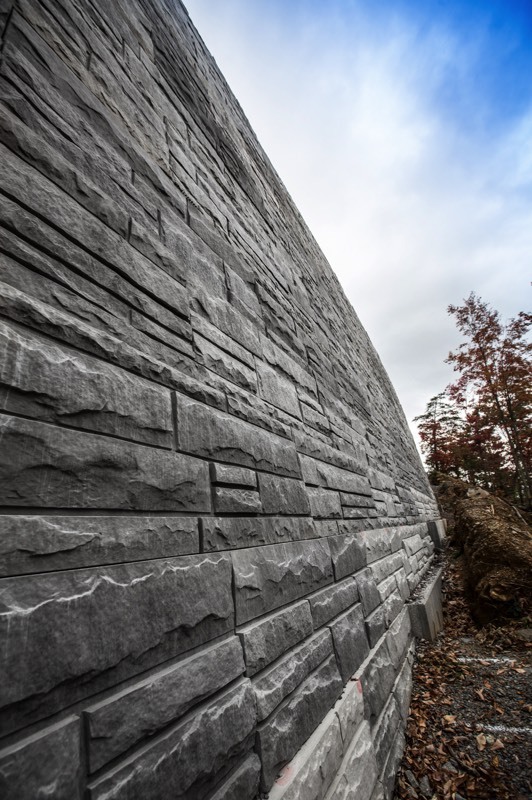 Stone Strong precast concrete blocks take center stage on The Foothills Parkway, where high elevations, a narrow construction corridor, and precise aesthetic requirements challenge contractors on a daily basis. 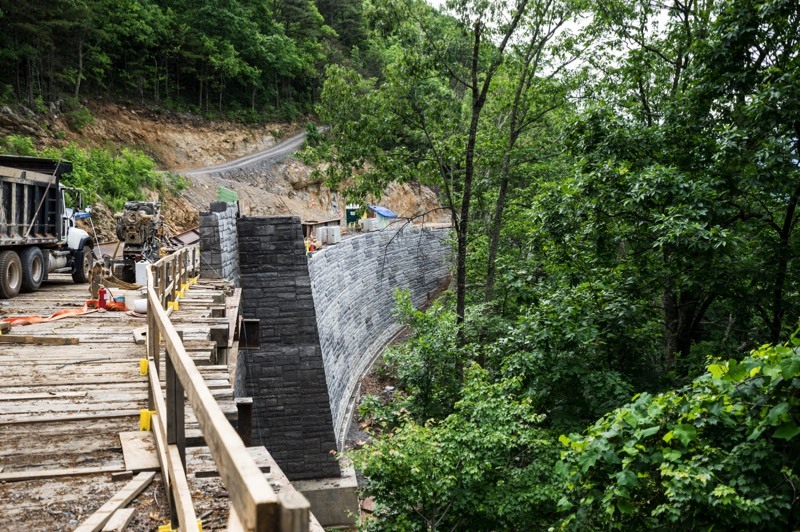 Situated in the foothills of the Great Smoky Mountains in Walland, Tenn., is a 72-mile scenic road that’s home to a construction project that will soon link together two beautiful, picturesque road segments into a single stretch known as “Foothills Parkway.” About 1.65 miles in length, the road project that’s underway will fill in a gap in the parkway that’s been extremely difficult for previous construction crews and engineers to navigate and work on. The area’s ravines, rocky ridges, tight tolerances, and steep terrain have all made the project nearly impossible…up until now. Started in 2010 and on track to be completed by 2017, the job site is home to a team of engineers, designers, and contractors who are spending seven years completing a road project that includes blasting, excavation and grading, concrete, and the construction of bridges and retaining walls. To make the latter, Saunders specified Stone Strong Systems’ precast wall system. Manufactured by NPCA member C.R. Barger & Sons, Inc., of Lenoir City, Tenn., the 14 precast walls will span over 80,000 square feet and reach over 70 feet in height. “I had used Stone Strong on a previous project in Maryland,” says Saunders. “The product made sense for this application, based on the tight tolerances, the rugged terrain, and the aesthetic appeal that made the product fit well with the natural surroundings.” On the economics side, Saunders says the precast wall system was extremely versatile and fit well with the site’s steep terrain and its varied wall height requirements. For the project, C.R. Barger spent months pouring the 24-square-foot blocks every day, according to Eric Barger, Vice President. The precaster is currently finishing up its aspect of the project, which will be completely finished in 2017. To assure a good match with the region’s beautiful, natural topography, a liner was used as a tool for replicating an existing stone finish. Because the blocks fit easily together, we were able to handle the extremely tight tolerances while keeping everything plumb and flush on the facing side. Thomas Meador - Assistant District Manager, The Lane Construction Corp. According to Saunders, Stone Strong was an especially good choice based on the high wall heights that exceed 50 feet. The product was also a good fit for use in an area where high elevations, a narrow construction corridor, and precise aesthetic requirements create daily challenges for the construction crews. Meador concurs, and says his firm’s $48 million contract includes the construction of a 2-lane roadway and five post-tension bridges that will connect the “missing link” in the Foothills Parkway. Commissioned by Congress in the 1940s, the parkway is part of a 7-park national parkland initiative that has yet to be fully completed. “When we’re finished, people will be able to enjoy 72 full miles of national scenic road,” says Meador. To achieve that goal, the contractor was asked to use a minimum block size of 2’ X 4’ – a specification that limited its material choices. “That stipulation regarding the large block size brought us to Stone Strong as an option,” says Meador. 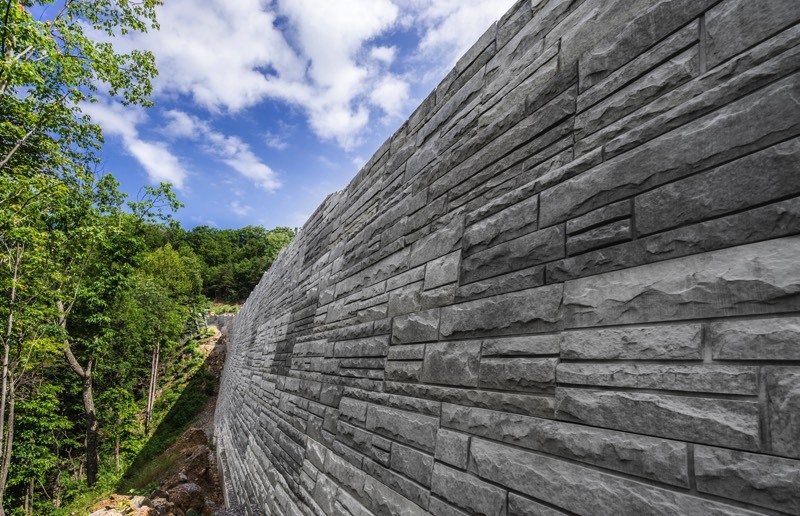 “Because the product was available in such large sizes, it was a good fit for this particular application.” In addition, the block would allow The Lane Construction Corp., to use a fractured stone finish that would help the wall blend well with its surroundings and any existing structures. The post-tension bridges that are currently in place, for example, feature a stone finish that “had to be replicated by using the block,” says Meador. To meet the demands of the project, Barger says the precaster ramped up production to the point where it was pouring about 28 blocks every day. To comply with the National Park Service’s aesthetic demands, the precaster had to mix integral color in with the concrete – an extra step that required much attention to detail and time. The fact that each block had to meet the owner’s minimum strength requirement of 4,000 PSI added more complexity to the precast manufacturing side of the project. “If the blocks didn’t meet that requirement it could spell bad news for everyone involved, and namely because of the extremely high wall height,” says Barger. “The blocks had be reinforced to the point where they met those requirements.” Once C.R. Barger & Sons factored the various project requirements into the equation, the precaster was able to start producing the Stone Strong blocks at a fairly rapid pace – all the while maintaining a sharp eye on quality and aesthetics.